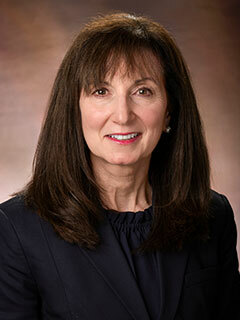 Lamia P. Barakat, PhD, is the director of psychosocial services in oncology at The Children’s Hospital of Philadelphia. She coordinates psychosocial programs for CHOP’s Division of Oncology. My role is to coordinate psychosocial programs for the Division of Oncology at Children's Hospital to provide the most effective support to our patients and their families. The child’s primary oncologist and/or social worker consult psychologists when they believe children with cancer and their families might benefit from additional support and intervention. As the director of Psychosocial Services, I’m proud of the comprehensive, integrated psychosocial care we provide to children with cancer and their families. These services include social work, child life, teacher and school support — as well as creative arts therapists and psychologists. Our psychosocial staff members are leaders in the field in psychosocial research on child, sibling and family adaptation to cancer and its treatment. They also excel in psychosocial assessment approaches to guide supportive interventions and interventions that promote resilience during treatment and into survivorship. Through multiple psychosocial programs for all members of the family, the Division of Oncology provides essential services to help children and their families successfully navigate the diagnosis and treatment process. Typically, every child and family is assigned a social worker and child life specialist. They also have access to hospital teachers and educational liaison to aid school reentry. In the Division of Oncology at Children's Hospital, psychological services consider the whole child in the context of their developmental level, family and home life, school and community supports and unique strengths and resources. We're interested in understanding who the child and family were before the diagnosis of cancer and what their hopes and dreams are for the future. Together, after standard psychological and behavioral assessment, we work to establish a plan to meet a set of common goals around management of the cancer and treatment, adaptation to hospitalization and transition back to home and school. My own expertise lies in how children and their families come together to address cancer diagnosis and treatment: how they can collaborate and support each other to meet the challenges of childhood cancer, while improving their quality of life. My research involves examining both risk and resilience when chronic medical conditions in childhood are present, particularly within the family and in the larger cultural context. My work also seeks to understand health disparities relating to follow-up care and participation in clinical research. The ultimate goal is to improve access to the best possible medical and psychosocial treatment for all our children with cancer and their families. In addition to my research program in psycho-oncology, I sit on the editorial board of the Journal of Pediatric Psychology and serve as a mentor to predoctoral psychology students, fellows and junior faculty through the DCAPBS Psychology Training Advisory Committee, the Department of Pediatrics Advisement Program. Daniel, L.C., Li, Y.B., Kloss, J.D., Reilly, A., & Barakat, L.P. (2016). The impact of dexamethasone and prednisone on sleep in children with acute lymphoblastic leukemia. Supportive Care in Cancer. doi 10.1007/s00520-016-3234-y. Hocking, M.C., Hobbie, W.L, Deatrick, J.A., Hardie, T.L., & Barakat, L.P. (2015). Family functioning mediates the association between neurocognitive functioning and health-related quality of life in young adults survivors of childhood brain tumors. Journal of Adolescent and Young Adult Oncology, 4(1), 18-25. Barakat, L.P., Galtieri, L., Szalda, D., & Schwartz, L.A. Assessing the psychosocial needs and program preferences of adolescents and young adults with cancer. Supportive Care in Cancer. Daniel, L.C, Li, Y., Smith, K., Tarazi, R.A., Robinson, M.R., Patterson, C.A., Smith-Whitley, K., Stuart, M., & Barakat, L.P. Lessons learned from a randomized controlled trial family-based intervention to promote school functioning for school-age children with sickle cell disease. Journal of Pediatric Psychology. Hobbie, W.L., Ogle, S., Reilly, M., Barakat, L.P., Lucas, M., Ginsberg, J., Fisher, M., Volpe, E.M., & Deatrick, J.A. Adolescent and young adult survivors of childhood brain tumors: Life after treatment in their own words. Cancer Nursing. Patterson, C.A., Chavez, V., Mondestin, V., Deatrick, J.A., Li, Y., & Barakat, L.P. (In press). Clinical trial decision-making in pediatric sickle cell disease: a qualitative study of perceived benefits and barriers to participation. Journal of Pediatric Hematology and Oncology. Marsac, M.L., Kassam-Adams, N., Delahanty, D.L., Widaman, K., & Barakat, L.P. (2014). Posttraumatic stress following acute medical trauma in children: a proposed model of bio-psycho-social processes during the peri-trauma period. Clinical Child & Family Psychology Review, 17(4), 399-411. doi: 10.1007/s10567-014-0174-2. Deatrick, J., Hobbie, W. Barakat, L.P., Ogle, S. Reilly, M., Hardie, T. Toth, J., Knafl, G. Knafl, K. (October, 2015). Using Mixed Methods Analyses to Tailor Theory-Based Family Interventions. Special Topics Conference: Emerging Areas of Family Health Research Across the Lifespan. Council for the Advancement of Nursing Science, Washington, DC. Salamon, K.S., Schwartz, L.A., & Barakat, L.P. (In press). Intervention to promote family and school functioning and health-related quality of life in pediatric hematology and oncology. M. Ferrari and C. DeMichelis (Eds. ), Promoting Resilience of Children in a Medical Context. New York: Springer. Barakat, L.P., Daniel, L.C., & Sills, R. (2014). Functional Symptoms in Hematology/Oncology. In R. Anbar (Ed.) Functional Symptoms in Pediatric Diseases: A Clinical Guide. New York: Springer. Daniel, L.C., Hocking, M., & Barakat, L.P. (2014). Cancer. In M.C. Roberts, B.S. Aylward, & Y.P. Wu (Eds. ), Clinical Practice of Pediatric Psychology: Cases and Service Delivery. New York: Guilford. Dampier, C., & Barakat, L.P. (2013). Sickle cell pain. In P. McGrath, B.J. Stevens, S.M. Walker, and W. Zempsky (Eds. ), The Oxford Textbook of Paediatric Pain. New York: Oxford. Barakat, L.P., Hocking, M., & Kazak, A.E. (2012). Child Health Psychology. In I.B. Weiner (Ed. ), A. Nezu, C. Nezu, & P. Geller (Vol. Eds. ), Handbook of Psychology: Health Psychology (2nd edition, vol. 9). New York: Wiley. Barakat, L.P., Kunin-Batson, A., & Kazak, A.E. (2003). Child Health Psychology. In I.B. Weiner (Ed. ), A. Nezu, C. Nezu, & P. Geller (Vol. Eds. ), Handbook of Psychology: Health Psychology (vol. 9). New York: Wiley. Barakat, L.P. (2000). Interest Box: Family and child adjustment to cognitive aspects of cancer in children. In E. Zillmer and M. Spiers (Eds. ), Principles of Neuropsychology. Belmont, CA: Brooks/Cole. Barakat, L.P., & Kazak, A.E. (1999). Family issues related to cognitive aspects of chronic illness in children. In R.T. Brown (Ed. ), Cognitive Aspects of Chronic Illness in Children. New York: Guilford. Barakat, L.P., & Alderfer, M.A. (2011). Introduction to the special issue: Advancing the science of family assessment in pediatric psychology. Journal of Pediatric Psychology. 36(5), 489-493. Barakat, L.P., Gonzalez, E.R., & Daniel, L.C. (2009). Positive psychology in pediatric psychology. In M. Roberts and R. Steele (Eds. ), Handbook of Pediatric Psychology (4th edition) (pp. 763-773). New York: Guilford. Barakat, L.P. & Boyer, B. (2007). Pediatric psychology. In B. Boyer and Paharia, M.I. (Eds. ), Comprehensive Handbook of Clinical Health Psychology (pp. 371-394). Hoboken, NJ: Wiley & Sons. Barakat, L.P., Gonzalez, E.R., & Weinberger, B.S. (2007). Chronic medical illness. In R.W. Christner, J. Stewart-Allen, and A. Freeman (Eds.) Handbook of Cognitive-Behavior Therapy (CBT) Groups with Children and Adolescents: Specific Settings and Presenting Problems (pp. 427-446). New York: Routledge. Radcliffe, J., Barakat, L.P., & Boyd, R. (2006). Family issues. In R.T. Brown (Ed. ), Comprehensive Handbook of Childhood Cancer and Sickle Cell Disease: A Biopsychosocial Approach (pp. 496-513). New York: Oxford. Barakat, L.P., Lash, L., Lutz, M.J., & Nicolaou, D.C. (2006). Psychosocial adaptation of children and adolescents with sickle cell disease. In R.T. Brown (Ed. ), Comprehensive Handbook of Childhood Cancer and Sickle Cell Disease: A Biopsychosocial Approach (pp. 471-495). New York: Oxford. Kovalsky, D., Hildenbrand, A. K., Kassam-Adams, N., Barakat, L. P., Delahanty., & Marsac, M. L. (November, 2015). Utility of Appraisals During Peri-Trauma as Predictor of PTSS Following Pediatric Injury. Poster accepted for the International Society for Traumatic Stress Studies 31st Annual Meeting, New Orleans, LA. Hildenbrand, A. K., Kassam-Adams, N., Barakat, L. P., Kohser, K., & Marsac, M. L. (November, 2015). Relationship between emergency department pain and subsequent posttraumatic stress in pediatric injury. Poster accepted for the International Society for Traumatic Stress Studies 31st Annual Meeting, New Orleans, LA. Stevens, E.M., Patterson, C.A., Li, Y.B., Smith-Whitley, K., & Barakat L.P. (September, 2015). Factors related to mistrust of clinical trials research among adolescent/young adults with sickle cell disease and caregivers of children with sickle cell disease. Oral Presentation, Sickle Cell Disease Association of American (SCDAA) 43rd Annual Convention, Baltimore, MD. Deatrick, J.A., Hobbie, W., Ogle, S., Reilly, M., Hardie, T., Barakat, L.P., Knafl, K.A., & Knafl, G. (August, 2015). Patterns of family management of young adult survivors of childhood brain tumors and their relationship to child & family functioning. Accepted for oral presentation at the International Family Nursing Conference, Odense, Denmark. Hocking, M.D., Quast, L., Fleischer, J.G., McCurdy, M., Turner, E., Briggs, N., Barakat, L.P., & Deatrick, J.A. (July, 2015). Examining Parents’ Perspectives of Social Competence in Pediatric Brain Tumor Survivors: A Mixed-Methods Approach. Accepted for poster presentation at the 2015 World Congress of Psycho-Oncology and Psychosocial Academy Workshops, Washington, DC. McCurdy, M.D., Quast, L.F., Turner, E., Pulaski, S., Black, C., Paltin, I., Barakat, L.P., & Hocking, M.C. (July, 2015). A Qualitative Examination of the Feasibility of a Computerized Cognitive-Training Program in Long-Term Pediatric Brain Tumor Survivors. Accepted for poster presentation at the 2015 World Congress of Psycho-Oncology and Psychosocial Academy Workshops, Washington, DC. Quast, L., Fleischer, J.G., McCurdy, M., Turner, E., Kazak, A.E., Barakat, L.P., & Hocking, M.C. (July, 2015). Illness-Related Family Life Difficulty of Pediatric Brain Tumor Survivors at the End of Tumor-Directed Therapy. Accepted for poster presentation at the 2015 World Congress of Psycho-Oncology and Psychosocial Academy Workshops, Washington, DC. Barakat, L.P., Britton, E., David, K., Reilly, A., Rogerwick, S., Sullivan, J., & Schwartz, L. (July, 2015). The Psychosocial Services Program of The Children’s Hospital of Philadelphia (CHOP) Cancer Center: translating research into practice. Accepted for oral presentation as part of a symposium on models of care in pediatric psycho-oncology at the 2015 World Congress of Psycho-Oncology and Psychosocial Academy Workshops, Washington, DC. Strategies for Learning in Pediatric Brain Tumor Survivors. Poster presentation at the meeting of the American Academy of Clinical Neuropsychology, San Francisco, CA. McCurdy, M.D., Turner, E., Barakat, L.P., Hobbie, W., Deatrick, J., & Hocking, M.C. (June, 2015). Processing speed mediates the relationship between radiotherapy exposure and executive functioning in young-adult survivors of childhood brain tumor. Poster presentation at the meeting of the American Academy of Clinical Neuropsychology, San Francisco, CA. Daniel, LC, Barakat, LP, Butler, E., Diguiseppe, A, & Schwartz, LA. (June, 2015). Sleep in Adolescents and Young Adults in the Year Post Cancer Treatment. Poster presentation at the Associate Professional Sleep Societies Annual Meeting, Seattle, WA. Artz, Z., Harms, L., Sullivan, J., & Barakat, L.P. (May, 2015). Integrating psychosocial education in patient/family education for caregivers of newly diagnosed children with cancer. Oral presentation at the annual meeting of the American Association of Pediatric Oncology Social Workers, Whitefish, MT. Quast, L., Fleischer, J.G., McCurdy, M., Turner, E., Kazak, A.E., Barakat, L.P., & Hocking, M.C. (April, 2015). Health-related quality of life in parents of pediatric brain tumor survivors at the end of tumor-directed therapy. Poster presentation at the 36th Annual Meeting of the Society for Behavioral Medicine, San Antonio, TX. Marsac, M. L., Ciesla, J., Barakat, L.P., Hildenbrand, A.K., Delahanty, D.L., Widaman, K., Winston, F.K., Kassam-Adams, N. (April, 2015). The role of cognitive appraisals and coping in predicting posttraumatic stress following pediatric injury. Poster presentation at the Society of Pediatric Psychology Annual Conference, San Diego, CA. Cole, D., Barakat, L.P., Marsac, M. L. (April, 2015). Dissemination of evidence-based tools to promote adaptive coping with chronic illness: The Cellie Coping Kit as an example. Paper presentation at the Society of Pediatric Psychology Annual Conference, San Diego, CA. Daniel, L.C., Kahl, D., Schwartz, L.A., & Barakat, L.P. (April, 2015). Development of the Sleep Disturbances in Pediatric Cancer (SDPC) Model. Poster presentation at the Society of Pediatric Psychology annual conference, San Diego, CA. Hocking, M.C., Quast, L., Fleischer, J.G., McCurdy, M., Turner, E., Kazak, A.E., & Barakat, L.P. (April, 2015). Family management and health-related quality of life and adaptive functioning in pediatric brain tumor survivors at the end of tumor-directed therapy. Poster presentation at the Society of Pediatric Psychology annual conference, San Diego, CA. Schwartz, L.A., Bonafide, C., Butler, E., Daniel, L.C., & Barakat, L.P. (April, 2015). A text messaging intervention for adolescents and young adults recently off treatment for cancer. Presented as part of symposium on Innovative Interventions for Children, Adolescents and Young Adults with Hematologic and Oncologic Conditions presentation at the Society of Pediatric Psychology annual conference, San Diego, CA. Szalda, D.E., Pultman, S., Sullivan, J., Barakat, L.P., & Schwartz, L.A. (March, 2015). Improving the Care of Adolescent and Young Adults (AYA) Oncology: Educational programming for pediatric oncology nurses. Poster presentation/published abstract at the annual meeting of the Society for Adolescent Health and Medicine, Los Angeles, CA. McCurdy, M.D., Turner, E., Barakat, L.P., Hobbie, W., Deatrick, J., Paltin, I., & Hocking, M.C. (February, 2015). Treatment intensity predicts self-awareness of executive functioning in young-adult survivors of childhood brain tumor. Poster presentation at the meeting of the International Neuropsychological Society, Denver, CO.
Pierce, L.A., Fleischer, J., Alderfer, M.A., Hocking, M.C., Kazak, A.E., & Barakat, L.P. (October, 2014). Caregiver distress and patient health-related quality of life: psychosocial screening during pediatric cancer treatment. Paper presentation at the psycho-oncology preconference of the meeting of the International Society of Pediatric Oncology, Toronto, Ontario, Canada. Brumley, L.D., Deatrick, J.A., Barakat, L.P., Ramharrack, F., Daniel, L.D., Palmer, S., Pierce, L.A., & Schwartz, L.A. (October, 2014). Development of a new measure of goal-based quality of life for adolescents and young adults with cancer. Paper presentation at the psycho-oncology preconference of the meeting of the International Society of Pediatric Oncology, Toronto, Ontario, Canada. Butler, E.S., Daniel, L.C., Barakat, L.P. (October 2014). Parenting stress as a moderator between health-related quality of life and anxiety for children with Sickle Cell Disease. Poster presentation at the Annual Convention of the Sickle Cell Disease Association of America, Baltimore, MD. Daniel, L.C., Barakat, L.P., Li, Y., Smith, K., Morrison, M., Tarazi, R., Robinson, M.R., Patterson, C.A., Smith-Whitley, K., & Stuart, M. (October, 2014). Family-based problem-solving intervention for school-age children with sickle cell disease. Poster presentation at the Sickle Cell Disease Association Annual Convention, Baltimore, MD. Marsac, M.L., Klingbeil, O., Hildenbrand, A., Alderfer, M.A., Smith-Whitley, K., & Barakat, L.P. (October, 2014). Translating evidence into intervention: The Cellie Coping Kit for Sickle Cell Disease. Paper presentation at the 42nd Annual Meeting of the Sickle Cell Disease Association of America, Baltimore, MD. Marsac, M.L., Barakat, L.P, Kohser, K.L., Donlon, K., Zajac, L., & Kassam-Adams, N. (August, 2014). Cognitive appraisals and posttraumatic stress symptoms in parents of children with injuries. Presented as part of symposium, Parents of a Critically Ill/Injured Child: Psychosocial Adjustment and Intervention, at the Annual Convention of the American Psychology Association, Washington, DC. Turner, E., McCurdy, M.D., Barakat, L.P., Hobbie, W., Deatrick, J., Paltin, I., & Hocking, M.C. (June, 2014). Impaired Awareness of Executive Deficits in Young Adult Survivors of Childhood Brain Tumor: Impact on Parent and Family Quality of Life. Poster presentation at the American Academy of Clinical Neuropsychology, New York, NY. McCurdy, M.D., Turner, E., Fisher, M., Barakat, L.P., Hobbie, W., Deatrick, J., & Hocking, M.C. (June, 2014). Predicting Cognitive Efficiency Following Brain Tumor Treatment in Childhood: Utility of the Intensity Treatment Rating Scale. Poster presentation at the American Academy of Clinical Neuropsychology, New York, NY. Morrison, M., Kassam-Adams, N., Barakat, L.P., Kohser, K., & Marsac, M. (June, 2014). Child cognitive appraisals predict later post traumatic stress symptoms following pediatric injury. Poster presentation at The Children’s Hospital of Philadelphia LEND Research Day. Schwartz, L.A., Barakat, L.P., Daniel, L.C., Dowshen, N., Butler, E., Hobbie, W.L., Kersun, L., Pierce, L., Wasik, M., Szalda, D., Brumley, L.D., Li, Y., & Bonafide, C. (May, 2014). Proof of Concept of an Infrastructure for Text Messaging Interventions at CHOP: Development and Evaluation of THRIVE (Texting, Health Resources to Inform, MotiVate and Engage. Presented at the 4th Annual Quality and Patient Safety Day, The Children’s Hospital of Philadelphia. Marsac, M.L., Barakat, L.P., Kohser, K.L., Kassam-Adams, N., Alderfer, M.A. (April, 2014). Supporting children through cancer: development and dissemination of the Cellie Cancer Coping Kit. Poster presentation at Association of Pediatric Oncology Social Workers Annual Conference, Philadelphia, PA.
Deatrick, J.A., Ogle, S., Hobbie, W., Volpe, E., Barakat, L.P., & Hocking, M.C. (April, 2014). Families and their impact on HRQOL: perspectives of adolescent and young adult brain tumor survivors. Poster presentation at the Sixth International Nursing Conference on Child and Adolescent Cancer Survivorship, Philadelphia, PA.
Schwartz, L.A., Butler, E., Brumley, L.D., Barakat, L.P., Deatrick, J.A., Daniel, L.C., Hobbie, W.L., Ginsberg, J.P., Szalda, D., Bevans, K., Kazak, A.E., & Tuchman, L.K. (March, 2014). Using theory and PROMIS methods to develop the Transition Readiness Inventory (TRI) for adolescent and young adult survivors of childhood cancer. Oral presentation at the Society of Pediatric Psychology Annual Conference. Klingbeil, O., Hildenbrand, A.K., Alderfer, M.A., Kassam-Adams, N., Smith-Whitley, K., Barakat, L.P., Marsac, M.L. (March, 2014). Coping influence of the Cellie Coping Kit for sickle cell disease. Poster presentation at the Society of Pediatric Psychology Annual Conference. Hocking, M.C., Hobbie, W., Hardie, T., Barakat, L.P., Deatrick, J.A., (March, 2014). Young adult survivors of childhood brain tumors and their mother mothers: Associations between neurocognitive and family functioning and maternal demand and worry. Poster presentation at the Society of Pediatric Psychology Annual Conference, Philadelphia, PA. Psychology Annual Conference, Philadelphia, PA.
Fleischer, J., Daniel, L.C., Tarazi, R.A., Patterson, C.A., & Barakat, L.P. (March, 2014). Educational needs and resources of children with sickle cell disease: a comparative analysis. Poster presentation at the Society of Pediatric Psychology Annual Conference, Philadelphia, PA.
at American Psychosocial Oncology Society Annual Conference, Tampa, FL. Marsac, M.L., Barakat, L.P., Alderfer, M.A., Kassam-Adams, N., Klingbeil, O., & Hildenbrand, A.K. (February, 2014). Development and dissemination of the Cellie Cancer Coping Kit. Presentation at American Psychosocial Oncology Society Annual Conference, Tampa, FL. Paltin, I., Minturn, J., Fisher, M., & Barakat, L.P. (May, 2013). Prospective case study of two 2-yeaer-olds with infratentorial ependymoma treated with proton radiation therapy. Poster presentation at the Annual Meeting of the American Academy of Clinical Neuropsychology, Chicago, IL. Daniel, L.C., Patterson, C.A., Robinson, M.R., & Barakat, L.P. (April, 2013). Child and caregiver psychological adjustment predicts health-related quality of life and disease management in pediatric sickle cell disease. Poster presentation at the National Conference in Pediatric Psychology, New Orleans, LA. Kazak, A.E., Alderfer, M.A., Hocking, M.C., Schwartz, L.A., & Barakat, L.P. (April, 2013). Check-in About Recent Experiences and Strengths (CARES): A web-based tablet-administered caregiver-report assessment protocol. Poster presentation at the National Conference in Pediatric Psychology, New Orleans, LA. Hildenbrand, A. K., Barakat, L. P., Alderfer, M. A., Smith-Whitley, K., & Marsac, M. L. (April, 2013) Coping and coping assistance among children with sickle cell disease and their parents. Poster presentation at the National Conference in Pediatric Psychology, New Orleans, LA. Schwartz, L. A., Brumley, L. D., Barakat, L. P., Deatrick, J. A., Daniel, L., Hobbie, W. L., Bevans, K., Kazak, A. E., Ginsberg, J. P., Tuchman, L. K. (April, 2013). Development of a New Transition Readiness Measure for Adolescent and Young Adult Survivors of Pediatric Cancer. Poster presentation at the National Conference in Pediatric Psychology, New Orleans, LA. Tuchman, L. K., Deatrick, J., Danzi, L. E., Daniel, L., Barakat, L. P., Hobbie, W., Ginsberg J. P., Kazak A. E., Bevans, K., Schwartz, L. A. (March, 2013). The Content Validity of an Initial Item Pool of a New Transition Readiness Measure. Poster presented at the 2013 Annual Meeting of the Society for Adolescent Health and Medicine, Atlanta, GA. Living with Hope: Supporting the Unique Needs of Adolescents and Young Adults (AYAs) with Cancer and their Siblings. Children’s Cancer Network Building a Strong Future Annual Survivorship Conference, Phoenix, AZ, Sept 2014. Pediatric Medical Traumatic Stress and Growth following Treatment for Childhood Cancer. Children’s Cancer Network Building a Strong Future Annual Survivorship Conference, Phoenix, AZ, Sept 2014. Health-related Quality of Life of Adolescents and Young Adults with Cancer. Differential Diagnosis in Pediatric Oncology: Childhood Cancer. CHOP Spring CME Dinner Lecture Series, Philadelphia, PA, May 2014. Pediatric Sickle Cell Disease: Update on the Psychosocial Research Program. The Children’s Hospital of Philadelphia Sickle Cell Center Parent Support Group, Philadelphia, PA, April 2014. Health-related Quality of Life of Children with Sickle Cell Disease. Regional Meeting of the Association of Pediatric Hematology and Oncology Nurses. Radnor, PA, March 2014. Health-related Quality of Life of Adolescents and Young Adults with Cancer. Annual Thyroid Cancer Conference, Philadelphia, PA, Sept 2013. Pediatric Traumatic Stress and Growth in Pediatric Oncology. CHOP Cancer Center Webinar Series, Sept 2013.